I was saddened to learn on the road that Buddy Catlett died yesterday. I remember him looking as he does in this photograph made around the time we were both involved in Seattle’s vibrant jazz community in the early-to-mid 1950s. He left town to work with a variety of large and small bands. By the end of the decade Buddy had joined the big band his childhood friend Quincy Jones took to Europe that also included Seattleites Floyd Standifer and Patti Bown. For an obituary, read the Seattle Times article by Paul de Barros, the leading chronicler of Seattle’s rich jazz history. Buddy solos on Thelonious Monk’s “Straight No Chaser” with a combo from the Jones band in 1959. His companions are Phil Woods, alto saxophone; Clark Terry, trumpet; Patti Bown, piano; Quentin Jackson, trombone; Sahib Shihab, flute; and Joe Harris, drums. Jim Wilke of Jazz After Hours fame will make his Jazz Northwest broadcast on Sunday a tribute to Buddy. Here is Jim’s announcement. Jazz Northwest will remember him with several unpublished recordings of the Local 493 Reunion Band on Sunday, November 16 at 2 PM Pacific on 88.5 KPLU and kplu.org. The group included veterans of the Black musicians union Local 493 in the years before it merged with the white musicians union Local 76. It is, rather, though, by name, drummer “BeBop” Joe Harris, of Dizzy Gillespie fame (!) here…Forgive a pedant!! It is, as noted below in my reply to Roger Hunter. Buddy: They’ll be jamming big time in Heaven tonight. Seattle will miss that fabulous smile. How nice to see and hear these guys young again! I knew Buddy in Seattle in 1949, when I got out of the army and moved into the University district. Buddy was playing alto then, and I was playing valve trombone. We played together at sessions and on Bumps Blackwell’s rehearsal band, where Quincy was starting to write arrangements. I subbed for Buddy on Quincy’s band at Birdland in 1961, because Buddy didn’t have a cabaret card. When I came out to play in a Kirkland jazz festival later, I didn’t get to see Buddy, but he loaned me a bass to play. I wish I’d had the chance to hang out with him more. I may be mistaken, but that looks like Joe Harris on drums. It is, of course. How “Morris” made its way there I’ll never know. It’s corrected. Thanks. Never say never. It got there because you copied the credits from the youtube post which also lists two different recording dates, 1958 and 1959. Thanks Doug, for the heads-up about Buddy Catlett. 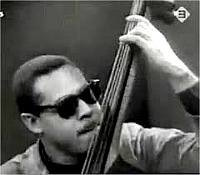 We’ll certainly do a tribute to him on the upcoming Wednesday Jazz Café at WRHU.